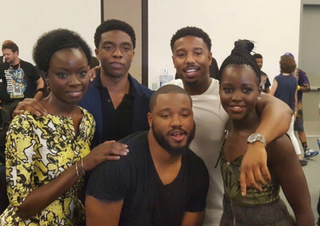 The cast of Marvel’s Ryan Coogler-directed Black Panther film was revealed over the weekend at the San Diego Comic Con. And needless to say, it's lit! Although the film doesn't hit theaters until 2018, it's great that Chadwick Boseman will be joined not only by Michael B. Jordan but also by Lupita Nyong'o and Danai Gurira. As we all know, Chadwick will play Black Panther, aka T'Challa. We saw Black Panther make his debut earlier this spring in the Avengers movie, so we got a sneak peek at what's in store. But what we weren't aware of until Saturday was who'd play the villain Erik Killmonger—that role went to Jordan. For those not familiar with the comic, Killmonger was hired to kill Black Panther's father and was exiled from the land of Wakanda. Nyong'o will probably have a chance to flex some muscle as one of the Dora Milaje bodyguards in the role of Nakia, and Gurira will play Okoye, the head of the Dora Milaje bodyguards. 2018 isn't around the corner, but the wait already seems worth it!